Magicians could join composers and artists in finding new ideas for their performances by using computers to create new magic effects, according to computer scientists at Queen Mary University of London (QMUL). Writing in the open access journal Frontiers in Psychology, the scientists, one of whom is also practicing magician, have looked at modelling particular human perceptual quirks and processes, and building computer systems able to search and find designs for new tricks based on these potential responses from the audience. The internet and social media platforms, such as Snapchat, Instagram and Facebook, provide rich sets of ready-made psychological data about how people use language in day-to-day life. This kind of data, the authors explain in the paper, could be exploited by computational systems that combine and search large datasets to automatically generate new tricks, by relying on the often ambiguous mental associations people have with particular words in certain contexts. For example, using clusters of words and their associated meanings could allow a magician to predict how a spectator might make connections between seemingly incongruous words in the right context and predict what they might say in a particular situation. 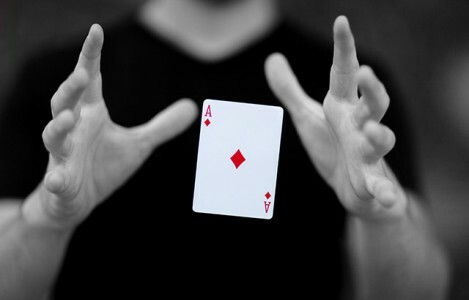 • Close-up magic: which relies on misdirection and sleight of hand. Here, computer science can give magicians a better understanding of the human visual system and how to beat the spectator’s gaze. This research is funded by the Engineering and Physical Sciences Research Council (EPSRC). ‘Manufacturing magic and computational creativity’ by Howard Williams and Peter McOwan is published in the open-access journal Frontiers in Psychology. Find out more about studying at QMUL’s School of Electronic Engineering and Computer Science.